An exhibition opening and discussion of The Amichai Windows by artist Rick Black will be held from 1 – 4 p.m. on Sunday, Feb. 18th, at Pyramid Atlantic Art Center in Hyattsville, MD. A bilingual Hebrew/English artist book that was 10 years in the making, The Amichai Windows features 18 poems by renown Israeli poet Yehuda Amichai. 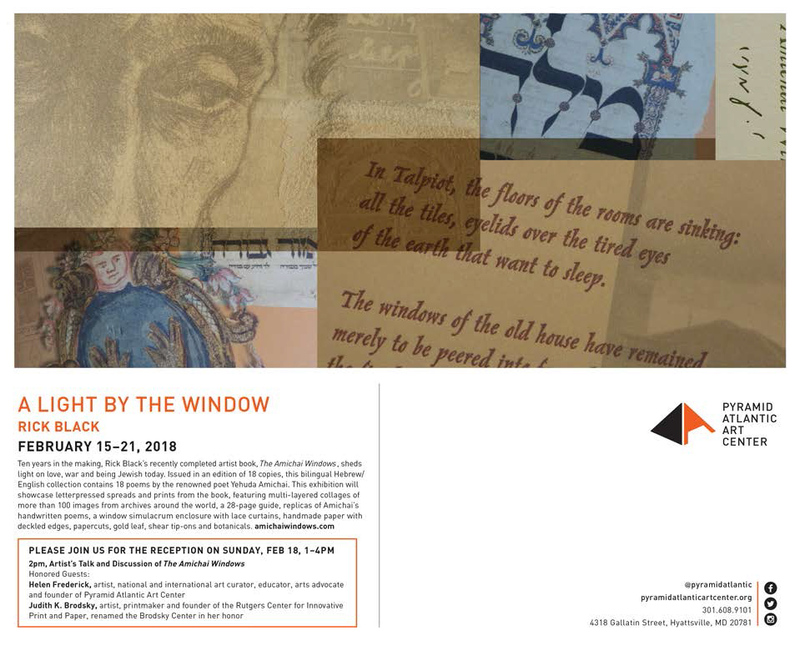 The exhibition will display letterpressed spreads and prints from the book, including multi-layered collages of more than 100 images from archives around the world, replicas of Amichai’s original poems and much more. Free admission with light refreshments. Fill out the form below with your questions or comments to TLP and we will be in touch with you shortly! Copyright 2019 Turtle Light Press, LLC. All rights reserved. Site map.